Snow has started in parts of southern New England, but remains relatively light. South of Boston, especially towards Cape Cod, the roads are snow covered and travel is slow. North of the Massachusetts Turnpike there is less snow as only a few flurries have fallen. It’s been a cold afternoon and this snow event will occur in very cold air. This means it will take less moisture to make each inch of snow. If you melted an inch of the snow from Saturday and compared it to an inch of tonight’s snow, Saturday’s inch would have 2 or 3 times as much water! 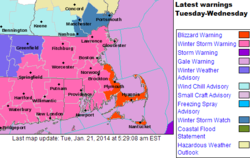 There is a blizzard warning up for Cape Cod, coastal Massachusetts south of Boston, Martha’s Vineyard and Nantucket. A blizzard means the visibility is expected to fall under one-quarter of a mile for three hours in a row due to snow falling or blowing snow. It’s not an indication of the amount of snow. For most of us, this is a typical January snowstorm, but it will have impact. Around Boston 6 to 9 inches of snow is a good number have in mind when thinking about the storm. 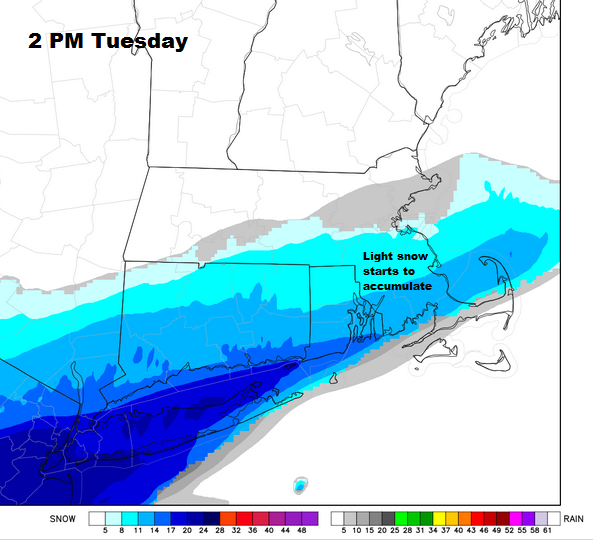 Areas south of city will have several more inches, while other areas well west of Route 495 don’t see that amount. This isn’t a long duration storm and the snow will be light, not wet. The evening commute will be impacted mostly south of Boston with the Wednesday morning commute impacted mostly east of Route 495 and south of Route 2. The two maps below show projections for how the radar and snowfall totals will turn out this afternoon and evening. These are based on models which are relatively new, but do give a good idea of trend. The heaviest totals remain over the southeastern part of the state. 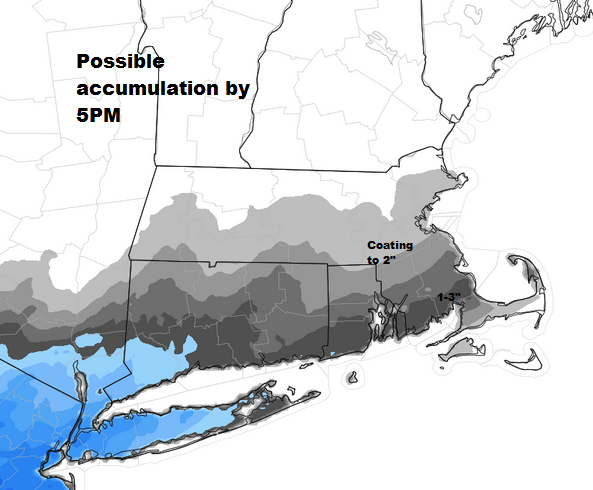 There will be a sharp drop in snow totals as you get west of Route 495. 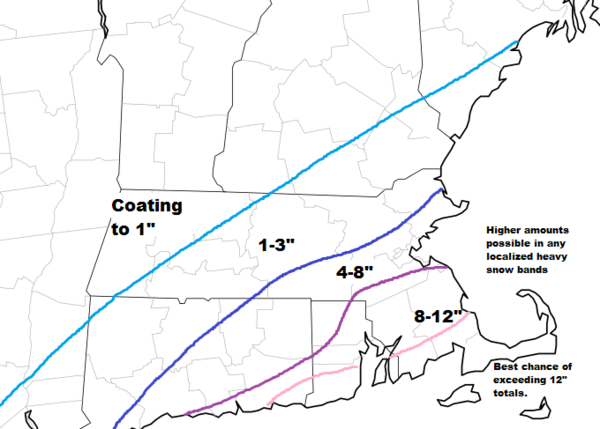 While Cape Cod is in the 8 to 12 inch band, I put a line to indicate where higher amounts could occur. I believe Boston itself ends up around that 6 inch total give or take an inch or two. That’s why this is a moderate storm for the city, but a more major storm south. Winds are going to be quite gusty during the storm. I am not expecting winds to reach damaging levels, but since the snow will be very light, it won’t take much wind to blow it around into drifts. The wind will whip up the snow enough to cause visibility issues overnight Tuesday. 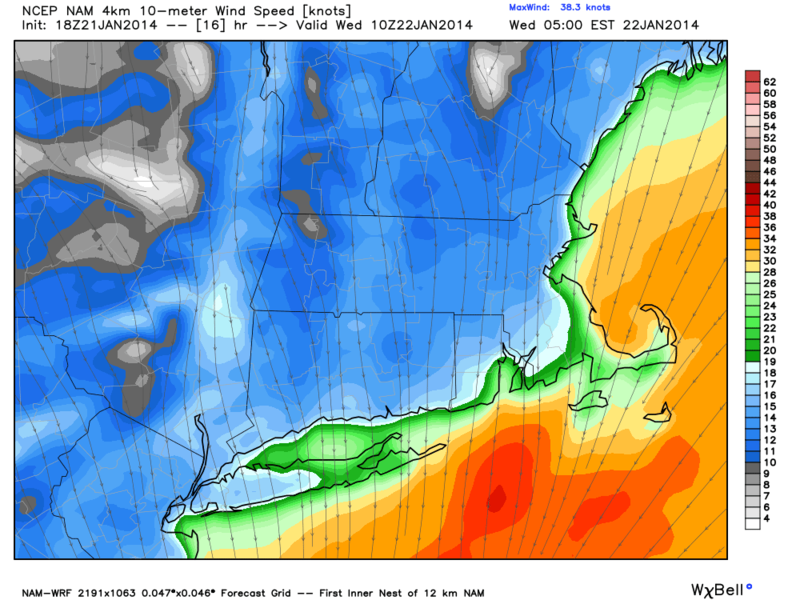 I do not recommend travel, especially along the coast from now through early Wednesday. Some afternoon activities might be impacted today, but there will be many delays and cancellations on Wednesday. This storm will hit Washington, DC, Philadelphia and New York earlier this afternoon. Air travel will definitely see issues today and continuing into Wednesday. Call ahead and bring your patience. We have seen how these storms are having bigger impacts to air travel than one might expect. Behind any snow, cold continues with frigid temperatures the rest of the week. Wind chills will be in the single numbers above or below zero Tuesday night and continue to be low through mid-week. There will be some moderation in the cold for the weekend before more frigid air returns next week. The cold pattern is likely to continue through the first week of February.